Should have buried that header but his goal was class. The rest of his day it just was a bit meh, he was still the most dangerous out of the three till Martial and Lukaku came on but nothing seemed to be coming off for him and we struggled to get the ball to him. Weird decisions at times like that attempted pass to Sanchez, what on Earth was he thinking. I guess that's his spot, across the keeper for the goal just like at Spurs. Scored and played through pain. Good to see someone taking responsibility, signs of maturity are there. Jose would be super proud. Absolutely. Jose wanted men in his team, not kids but as a manager he was a short term solution just like in other cases of his career. His heading ability has always been suspect, verging on shocking. Could be due to his sudden growth spurt. Gotta sort that out. He needs to get thicker. I know the CAF fitness experts will come out and talk about how being slim is everything but I want to see him become a unit. He's 21 can easily go through a Ronaldo like transformation! Bad miss on that header but beautiful control and finish on his goal. Luckily he wasn't injured. I was so certain that he was never hurt after scoring that goal, he has that arrogance in him that he probably felt he's too important to the team and did enough soon after he scored and then faked an injury afterward and cruised through the entire game. He was poor other than the goal, and he really should have scored prior to that yet again. We can't afford our main striker to keep on missing these easy chances, it's basically an equivalent to any defenders making defensive errors that lead to a goal. Adding on unnecessary muscle didn't work for Memphis, Valencia or Lukaku. I don't think he needs to get any bigger. Incredible the transformation in his game the last few months, but especially kicking on since Ole came in. Between him, Martial and Pogba... that's our future and if they all stay at United, we'll definitely win a title with them IMO. And worked for Zlatan and Ronaldo. Also, Lukaku become a much better player after his initial muscle gain. This whole gaining muscle after Belgium world cup stuff is just an excuse. I think Lukaku was a much better player when he was lean. You think he was faking an injury in order to bait Leicester defenders? Yeah, he really needs to take some lessons on heading. He is poor at it. But he had a good game today, clearly our best forward. We can’t play Alexis and Lingard at the same time again, our whole front line just unravels. If we have Martial/Rashford/Lingard all 3 will do better than today. That right side signing is going to be make or break. Same with the center back. There's only so many times you can feck up before you stumble on a solution, and I think we're really set up for success with those 3, not to mention De Gea being in goal, Shaw being only 23, and so on. Who knows, maybe Greenwood comes in and beats out whoever we buy this summer and becomes a top player and completes that front 3 for us. He is going to be frightening in a few years, and he’s ours! Lukaku's lean and Rashford's lean are very different. 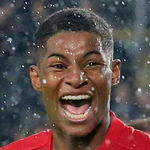 Rashford could definitely do with filling out a little because currently he lacks the upper body strength to hold of quite a lot of PL centre backs. I like Rashford but I noticed when Pogba was driving balls, Rashford were behind him, it happened often. Off balls, he was good, pressing and winning second balls back and movement but with balls, he needs to be in No.9 all time who can score a goal for us in the right position, otherwive he may not get a lot of chances like this if he were not moving or behind his teammate when we have balls. Dunno. As a young player in Chelsea he looked lean and then he bulked up at Everton and started doing very well. It's not like his pace has gone he can still burst hard. Also, Pogba used to be a skinny kid. Bulking up has made it near impossible to push him off of the ball. This guy misses sitters for days but scores fantastic goals in his sleep. That touch to control Pogba's pass was amazing. Great takedown and finish for the goal. Bad miss before it. Don't really remember much about his performance after that. Reminded me of Ronaldo’s 2nd goal in that 6-0 where he scored a hatrick. The runs he makes are insane. Kept on noticing that whenever Pogba got the ball in the second half, he was making a run. Contrast that to Lukaku to whom Young had to point where to run inspite of him being fresh. Don't think so. He's is good as he is. Homie are we still talking about Rashers here? I find myself flinching when he goes down for a tackle knowing his absence would be a huge blow for us and Ole. The transformation of his standing within the squad is mega this season. Like few mentioned, when Pogba gets the ball he just makes the runs. This is something he said (or ole) said in one of the interviews. He is having very good season and looks like a player good enough to lead the line, more importantly he is not limited player. He makes the runs, he can create chances for others out of nothing and also scores goals out of nothing now and then. His post match interview is great, what a top lad he is! I think he wasn't at his best yesterday, yet a wonderful first touch and finish for the goal. I hope that limp he had in the first half is nothing and he is fit to go. Yeah, people considering ronaldo as a benchmark for every player and individual is an unrealistic expectation. Rashford has a great core strength already and his lean frame helps in movements so nicely. What ronaldo had is better ball control and better balance and a lower centre of gravity , along with his tenacity and core strength, which rashford lacks at times and get dispossessed, its not his thin frame which is responsible for that. Ronaldo's freak nature is what ultimately got him injured, it wasn't sustainable like that long term with playing the way he was. Teams have started man-marking Pogba affecting our fluency at the front as Pogba has played deeper to find space.